A brief summary of some of our current ongoing projects and the collaborations that are helping them come to fruition. Discovering neuron specific functions of motor proteins. Isoforms of the cytoplasmic dynein intermediate chain (DIC). There are two genes for DIC, dync1i1 and dync1i2 (producing proteins DIC1 and DIC2 respectively), which are both alternatively spliced. All cells express the blue isoform, DIC2c. However the DIC1 gene is specific to mammalian neurons, as are all other splice-forms of DIC2. Click to enlarge. The microtubule motor protein repertoire of neurons is significantly expanded compared to other cell types, with the expression of nueron specific genes and isoforms. Despite the importance of microtubule transport to neuronal function, most of these neuron specific motor complexes have not been studied in detail. We define motor complexes by inclusion of neuron specific subunits and then identify their role in neuronal function. Understanding the molecular difference between fast and slow axonal transport. Kinesin-1 motors power polarised long-range transport along microtubules: distances covered can be metres in neuronal axons, taking days or even weeks. 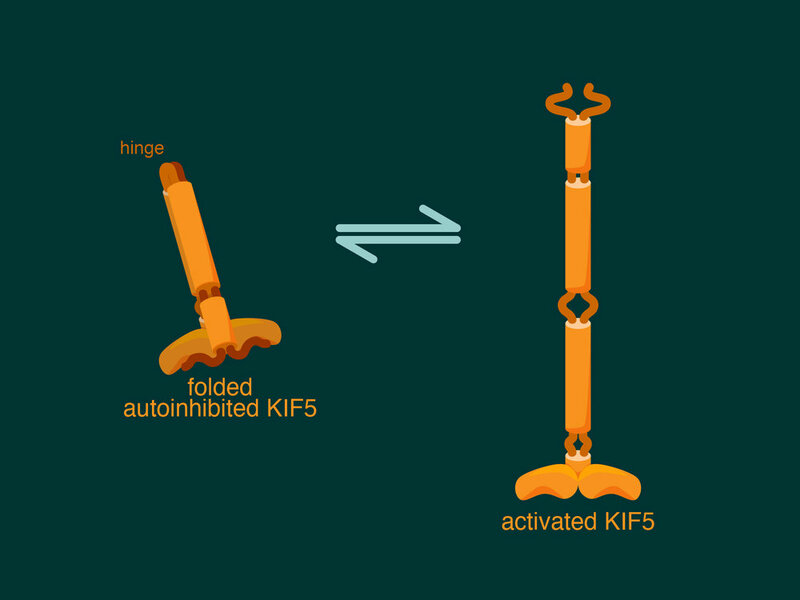 Kinesin is folded and auto-inhibited when inactive, and efficient transport requires both unfolding and stable recruitment to cargo. Although axonal cargoes can be transported at kinesin’s maximum speed (Fast Axonal Transport, FAT), the majority of newly synthesised protein moves 10 to 100 times more slowly (Slow Axonal Transport, SAT). The direct recruitment of kinesin to vesicles by adaptors for FAT is well characterised. We recently identified direct interactions between kinesin and a SAT cargo. We are working on a mechanistic understanding of cargo specific differences in activation, recruitment and retention of kinesin to explain these two differing transport speeds. This work is in collaboration with the Craggs Lab in the Department of Chemistry. A cartoon depicting the heavy chain of kinesin-1 unfolding. Establishing whether augmenting kinesin activity has therapeutic potential. A limited supply of kinesin motors means that slow cargos are only transported short distances before they are released, whilst the kinesin continues it's processive motility with a new cargo molecule. For some time it was thought that kinesin motors are present in excess within cells, and that kinesin’s potent autoinhibition mechanism controlled recruitment to cargo. 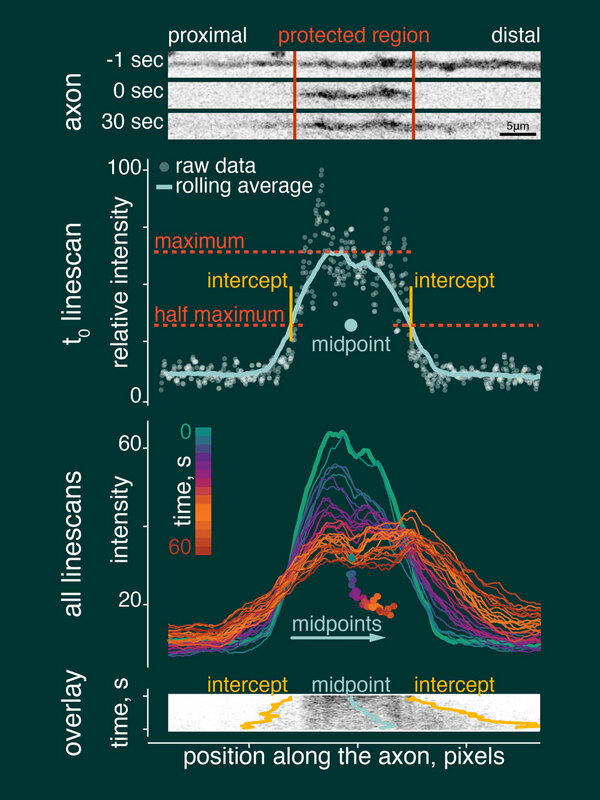 However, based on extensive experimental observations we recently proposed the ‘kinesin-limited’ model of slow axonal transport, stating that kinesin is in rate limiting supply for slow axonal transport cargos. One important consequence of this model is that overexpressing kinesin or augmenting its activity could increase the rate of slow axonal transport; this could provide downstream positive effects on protein homeostasis in the axon, making it a potential treatment avenue for diverse conditions linked to decreases in axonal transport. We are currently establishing the validity of this model. Generating new tools and strategies to study axonal transport. When you use microscopy to study biological questions, your interpretation of cellular behaviour can often be limited by what you can visualise in the images you generate. Consequently, the lab is constantly developing new probes and analysis strategies for the study of axonal transport. A summary of the novel analysis strategy designed to study the slow transport of cytoplasmic dynein. This study was carried out on primary cultured neurons from the dynein-GFP mouse. Axons were isolated in microfluidic devices and the movement of discrete populations of dynein-GFP were tracked through time.